Last summer, when we visited Madeline Island, we had the pleasure of meeting a friend's 11-year-old niece, Lily. She was a caring baby sitter, a fearless cliff jumper (evidence here, 3rd photo from the bottom), and a happy baker of this bread--which she made from memory. 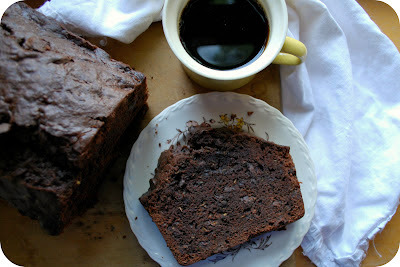 We were quite smitten with her, as well as this chocolate zucchini bread. We ate it for breakfast, mid-afternoon snacks with tea, and for dessert--we ate so much of it, we actually had to ask her if she would kindly bake a second batch. Then we asked for the recipe. So, here it is--for all of you. 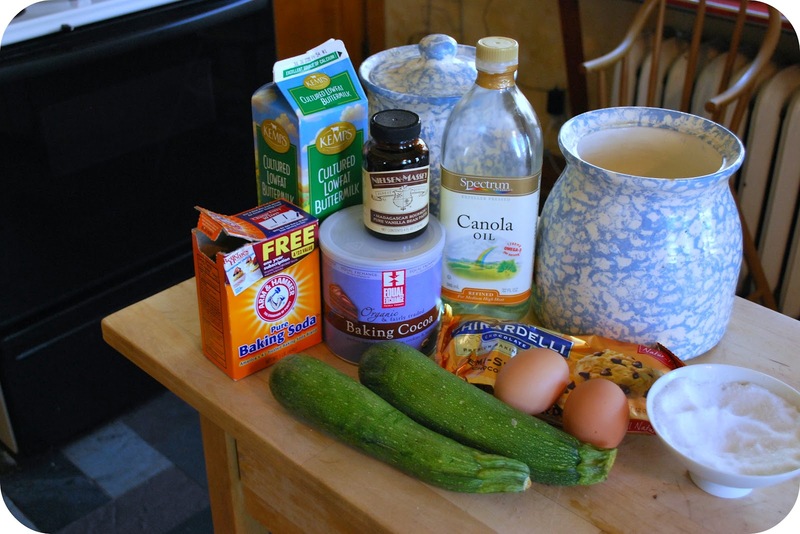 Because it is high zucchini season and gives you something delicious to do with a glut of zucchini--or with that enormous foot long zucchini you see at the farmer's market for $1. You can whip the batter together in 15 minutes--grating the zucchini is the hardest part, although, really--how hard is it to grate a zucchini? Exactly. 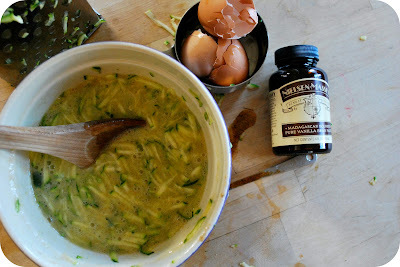 (You should know that you can grate your zucchini and freeze it for use later in the year for this bread too--it will seem watery when you thaw it out but throw it all in and it will work just as well as freshly grated zucchini). 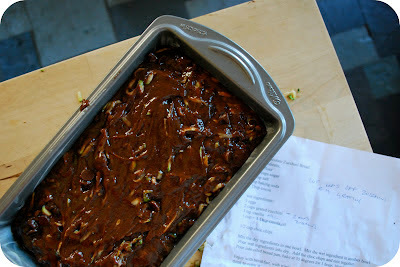 I made one large loaf of this bread--as opposed to dividing it between a couple of pans. If you make one large loaf, you will have to watch the baking time and stick it with a skewer to check that it is cooked through--mine took about 1 hour and 15 minutes but I think I could have given it another 5-10 minutes because it was just a little gooey in a small spot in the center. We brought this on a picnic and served it up for dessert topped with whipped cream and fresh strawberries. Then we ate the remainders straight up for breakfast. Don't tell anyone I said so, but it is also really good with store bought chocolate frosting slathered on top--and just think, because it has all that zucchini in it, you can still count it as a serving of vegetables. Thanks for sharing! 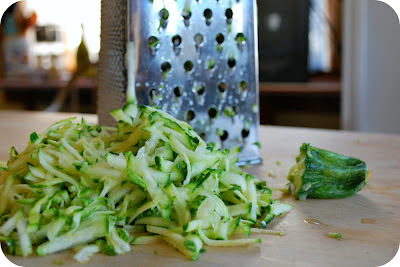 I also didn't know that you could freeze grated zucchini. Might seem like an odd question bu I know that you enjoy some of "joy the bakers" recipes, did u happen to buy her cookbook? I'm thinking of getting it but was curious what you thought of it-that is if u purchased one yourself. Thanks! Thank you so much for this post. I want to let you know that I posted a link to your blog in CBH Digital Scrapbooking Freebies (please, notice the new url for my blog), under the Page 1 post on Aug. 14, 2012. Thanks again. Nancy, I do not yet have Joy's new cookbook in my possession, but it is on my Amazon wishlist...I mean, I love her blog and her recipes there so I figure I will also love her cookbook...yes? I use zuchinnis in gratins, purees, soup, salad ... But never in cake ! I'll try ! 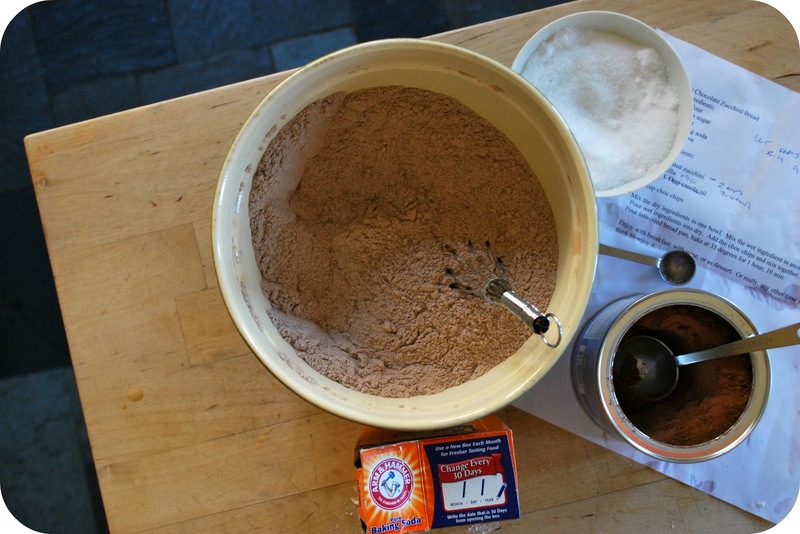 Thanks for sharing the recipe ! Hi, Thank you for the recipe. I made it today and it was good! The kids didn't even complain about the zucchini. One question, the post pic that shows ingredients had buttermilk container but there was no buttermilk in the recipe? Yeah, that buttermilk container should not have been there...but i am glad you enjoyed the bread! 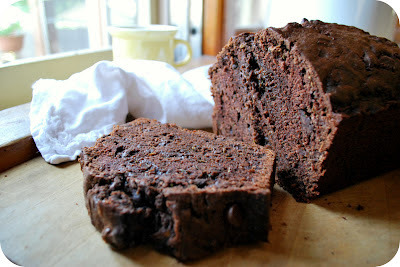 I love zucchini bread but have never made it with chocolate. I will have to try this!